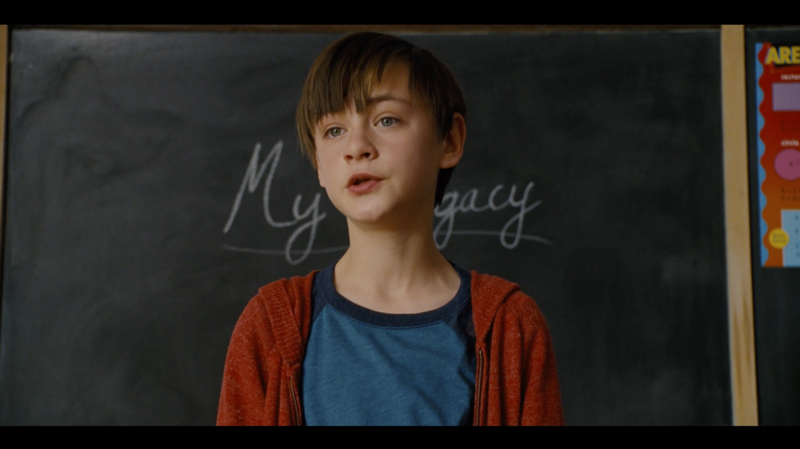 In this exclusive clip from "Jurassic World" director Colin Trevorrow's "The Book of Henry" (out everywhere on June 16th), the title character (played by Jaeden Lieberher from "Midnight Special") describes what he wishes his legacy to be. It's a touching sequence, off kilter and affecting like the rest of the movie, and much like the movie's marketing materials so far, purposefully mysterious. In order to get to the bottom of the clip (and the movie), we spoke to Lieberher. Get ready to open "The Book of Henry" with Henry himself. As for the exclusive clip, I asked if this was a good example of who Henry is as a character. "It is," Lieberher said. "It's the first time you see how he views the world and how he views other people. And it also shows the great qualities in Henry and how much of a good person he is." Lieberher went on: "Right there and then, clearly he is a genius but during that speech he's a normal boy. So he's easier to get into. He's just around the other students and telling it like it is." When I brought up the fact that between "The Book of Henry" and the highly underrated "Midnight Special," he's cornered the market on characters that have a little something extra going on, Lieberher said it was a fun aspect to play. "It's pretty cool playing someone that is not exactly normal," Lieberher said. "It's pretty fun playing those types of characters, you get to play around with their personalities and develop who they are." And while Lieberher might be a young actor, working so closely with a trained actress like Watts, he didn't feel the need to pepper her with annoying questions (which is probably what I would have done) but instead chose to observe her. "I paid attention to how she worked and how she acted, because when you're working with someone like that it's easy to learn a lot," Lieberher said. When I asked what the biggest takeaway was, he said, "She doesn't just use her words when she's acting, she uses her whole body. I think I learned a lot from her." "The Book of Henry" is a smaller, quieter movie that is obviously being released in the middle of summer, a time usually reserved for superhero movies, plus-sized sequels, and animated epics. I asked Lieberher to explain why people should take a chance on something as esoteric and emotional as "The Book of Henry." "Well I think you see big movies like those, there are only a few feelings you get from it. Maybe you're excited by the action. But this movie brings a lot to the table and makes you feel so many emotions and feelings," Lieberher said, sounding like the preternaturally gifted character he plays in the movie. He continued: "It'll make you feel for the family, it'll make you excited, it'll keep you on the edge of your seat, and maybe you'll cry or laugh. That's what makes this movie really great and interesting." "The Book of Henry" opens on June 16.